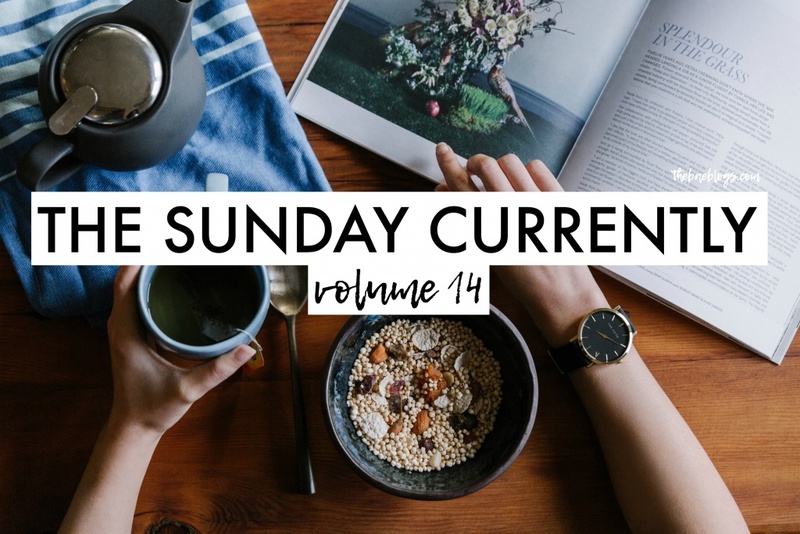 I actually missed writing The Sunday Currently volumes. Personally, I think this is the laxest blog post that you can write, but at the same time, it makes you realize where you actually use your time. At least for me. Like other series, this one is also quite interesting to read and allows your readers to keep updated on your life, even just a tad bit. So let’s do this. Writing: This Sunday Currently volume. It’s only the 14th, really? I was also thinking of writing a travel blog post, but I’m feeling lazy.. as always on a weekend. Smelling: Nothing. Can I officially eliminate this question from this series because I will always keep saying I don’t smell anything? Seriously. Why am I so mad., though. Wishing: I finally know what web hosting service to get. I need a cheap but effective one because my Bluehost service is about to expire in 2 weeks and I’m not paying another Php 500 for that. No, sir. Hoping: I get paid by my clients soon. Hehe. And that mom buys me the turmeric tea we’ve been looking at yesterday. I’m not sure if she’ll take the bait (my text). 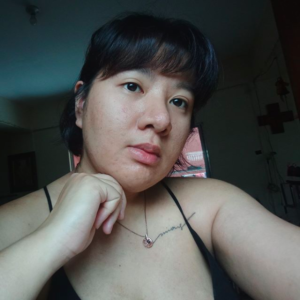 Wearing: A tank top from Cotton On (LOL, this was the same shirt I was wearing the last time I was writing a TSD volume. Hehe. ), a pair of boxers, and my weird undercut. It’s starting to grow back so the strands are sticking out. I should have this shaved soon. 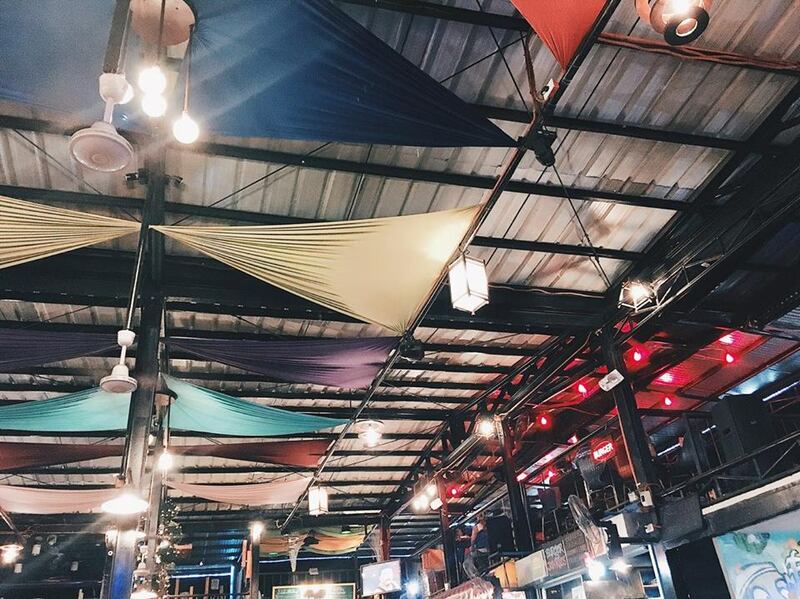 Loving: My Jazz playlist, and the corned beef I had for brunch. I’m about to get some in a bit because apparently, I need to eat every hour. Bruh. Wanting: A cheap web hosting service. Can somebody please suggest a really good one so I can stop yapping about it already. Needing: Money. And food. I’m hungry. But seriously, I need to work on my vlog backlogs, some blog things (optimize my photos, clean my content, delete old and irrelevant blog posts. I’m still working on it but I’ve gotten rid of 2011 to 2013 blog posts already. Yaasss). Clicking: This blog post, Facebook. That’s about it. 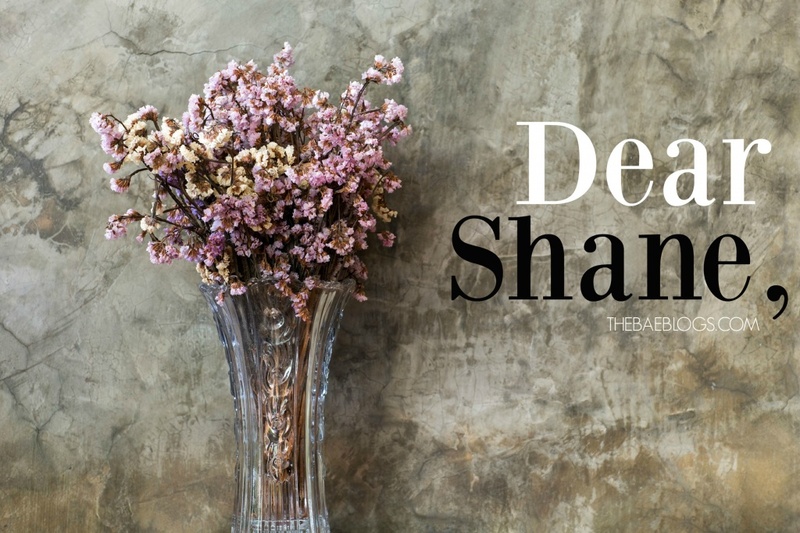 I usually update my TSCs (and other blog series) whenever I’m having a writer’s block or still in the process of writing my next post but not sure when I’ll finish. Haha! It’s somehow a filler post but I love how satisfying it is to get back on a simple list and keep track on how my life is going. 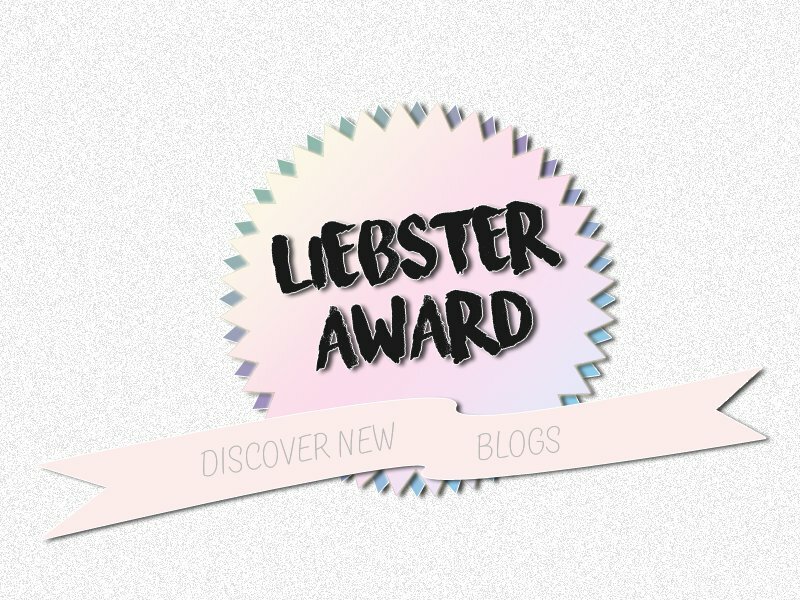 It’s like, I can get to reflect and update my blog without really thinking too much. I can’t help you with the hosting problem since I am not hosted myself. But will definitely keep those for reference just in case. Hehe. Actually! It’s good as any content din and it’s personal. I do the TSC series when I’m bored, to be honest. And I wanna write, pero ayoko masyado pagisipin susulat ko. 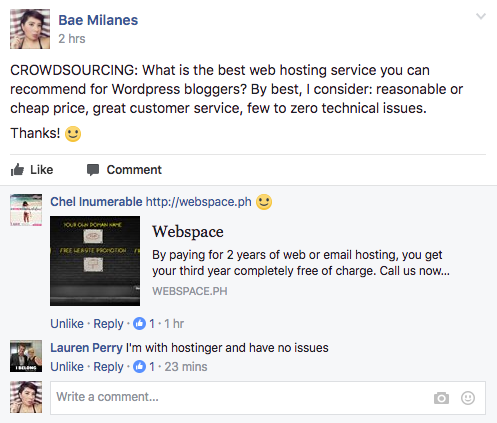 Hindi pa din ako nakakahanap ng hosting service. Di pa ako nagreresearch masyado, pero marami pa rin nagrereply sa Facebook. 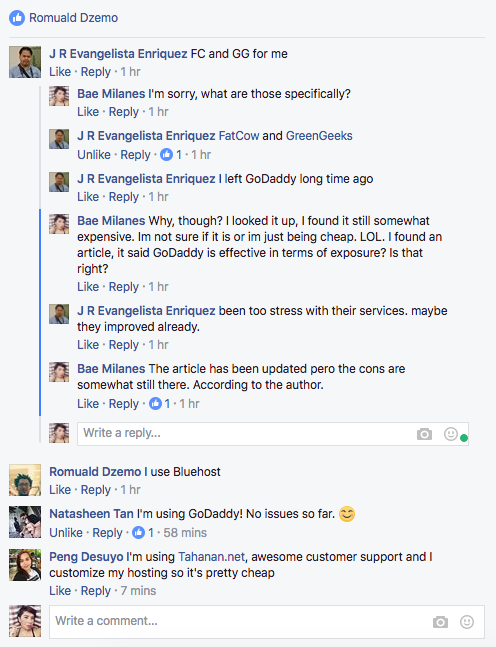 Nagulat ako, nagrenew yung Bluehost. ? So until April pa yun. When I find a replacement, I’ll remove my billing info na para di na magcharge. Is it good? Grace also uses HostWithLove. How’s the price? I really want a cheaper one kasi I feel I spend too much with Bluehost, with not enough benefits. 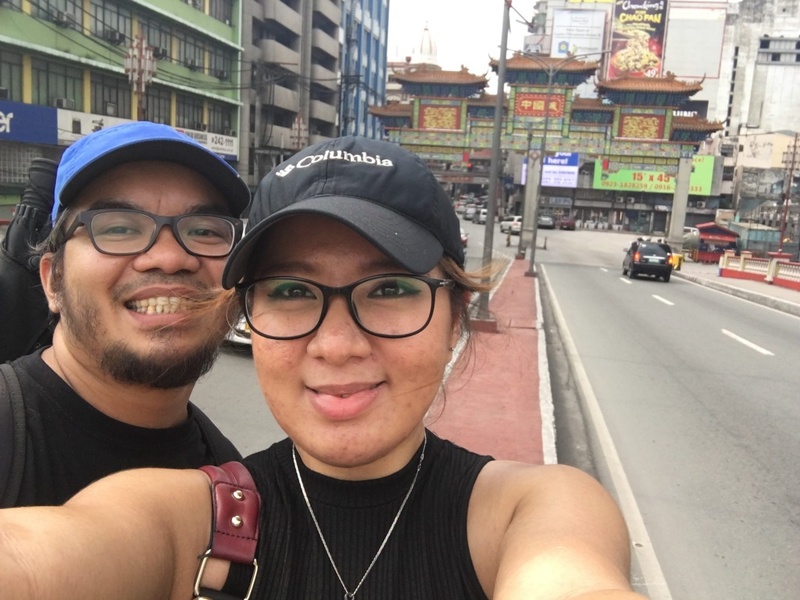 I was hosted with HostWithLove by the help of Ate Grace. Maybe she can help you in regards with the hosting services in HostWithLove. Meanwhile, Ate LA is hosted at Pangalan.com but for free for two years and if I’ll be paying for a hosting plan, I’d go for Pangalan.com because of the offers in an affordable price. Is the quality and customer service ok, though? I’ve been hearing of Pangalan.com recently nga. I think maraming bloggers na affiliates din. I see it often in Facebook groups. The last time I wrote TSC was back in September. Hahaha! I agree with you! The “smelling” part in TSC should be removed. It was really difficult to answer it. I already mentioned this on Twitter, but I recently moved to SiteGround. 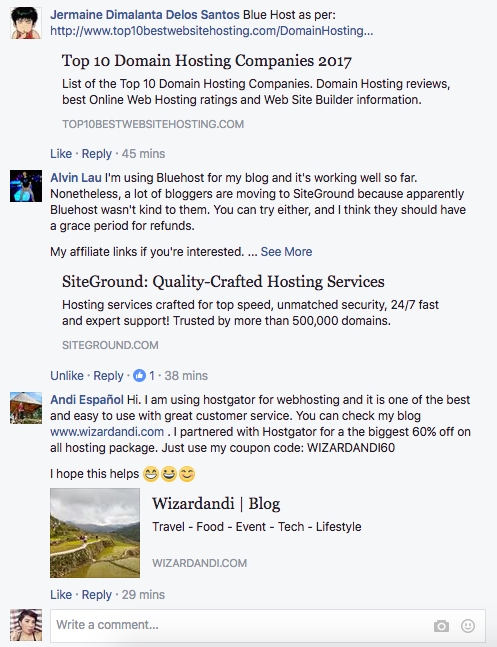 I really can’t recommend anything yet because I’ve only been with BlueHost for a year, and I’m new to SG. So far, I’m happy with their customer service. And it’s true that BH wasn’t kind. HAHA. It’s kinda difficult to talk to their customer service. Most of the time, I had to wait longer before I could speak to any of them. But in SG, I only had to wait less than 2 minutes and they really answer all of my questions. They even helped me decide which plan I should get. My domain is still with BH, though! I was not able to transfer it to SG. 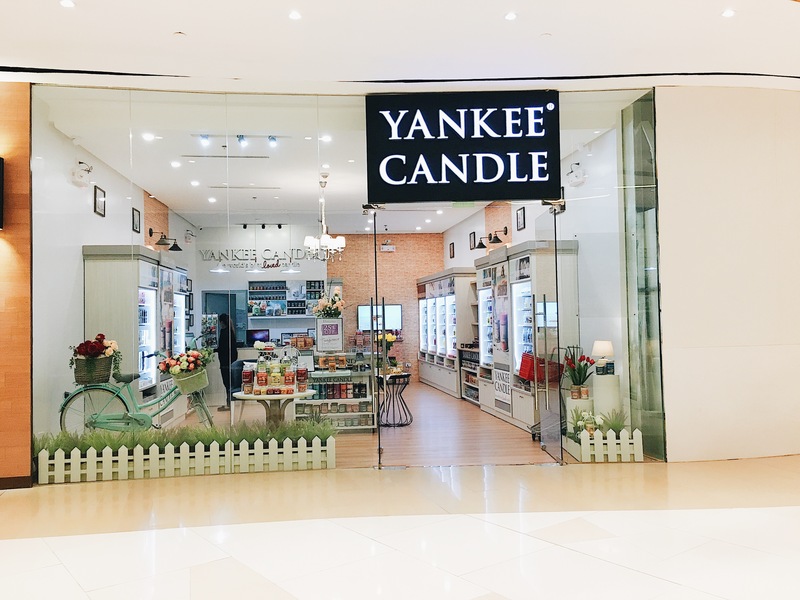 I saw many bloggers user Grace and Pangalan too, but I have checked it out. I hope you’ll know what web hosting service to get soon! Sana nga! At least now I have until mid-April to decide. I’m scared to transfer hosting services kasi baka magalaw yung content ko. 🙁 Yun lang naman biggest worry ko. So it would really help if someone more knowledgable does it for me. Para pag may mali, siya sisisihin ko. Charot. Hahaha. I’m using Namecheap 4G Value Plan. You can add three domains, unlimited na lahat bukod sa 100GB na storage. They have 24/7 support na kahit di na nila coverage, tutulungan ka pa nila. 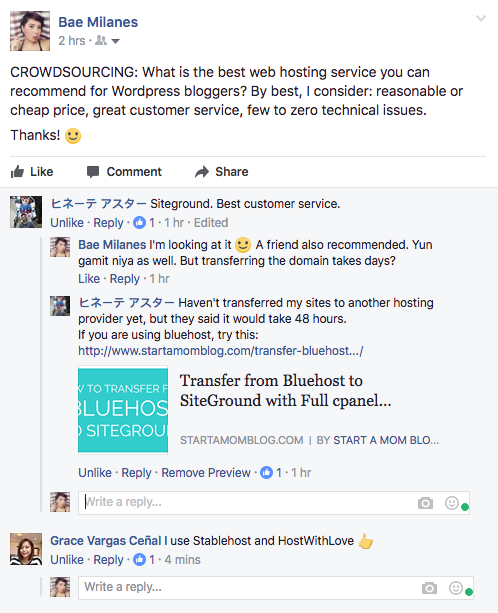 Tapos I purchased a Baby Web Hosting Plan sa Hostgator kasi you can add unlimited domain, 100GB storage and the rest unlimited na din. Thanks, Clint! I’ll check the Hostgator one, aside from the 1,632,745 other recommendations by other bloggers. Haha! Yung Namecheap, isn’t it for the domain lang?